We are in the process of making screenshots of version 4.0. 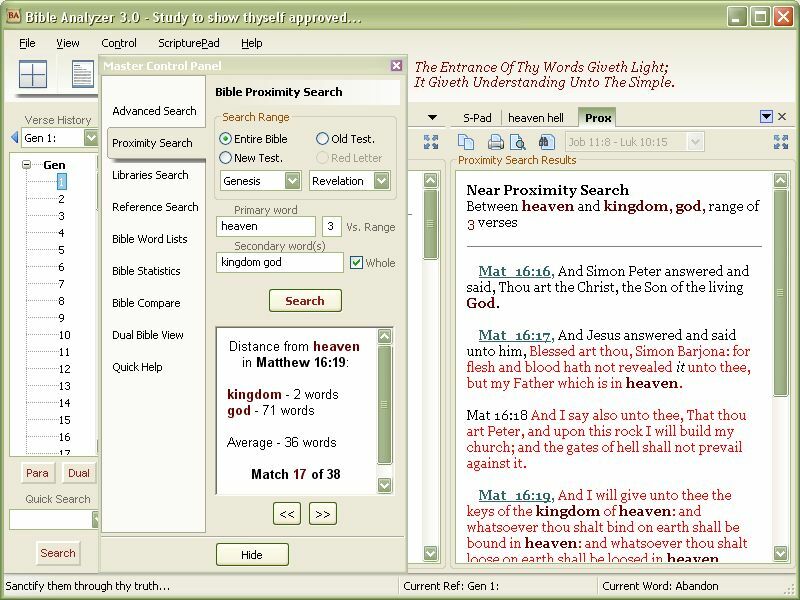 Below are Screenshots and Descriptions of the major features of Bible Analyzer 3. 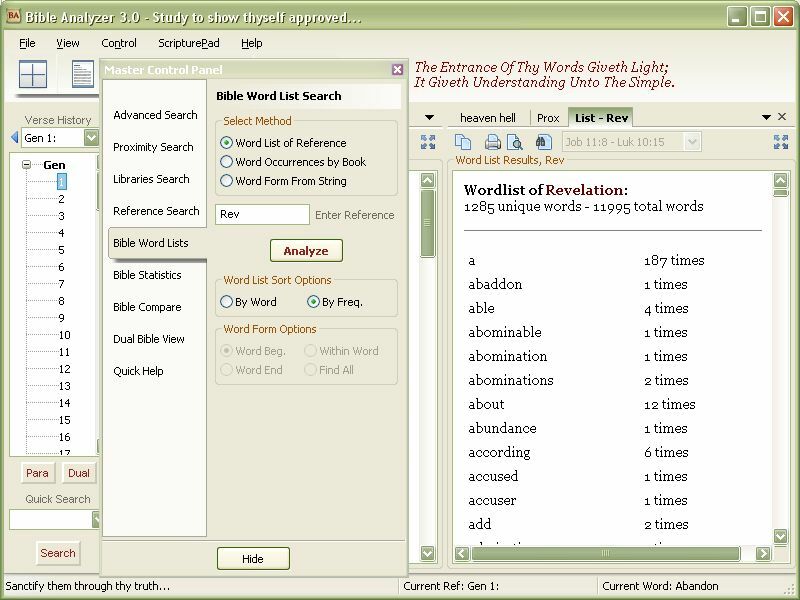 This is the Main Window of Bible Analyzer. It is composed of four panels and a Bible Tree on the far left where quick selection of a chapter can be made. The chapter is displayed in the Bible Panel (top left). A different translation can be displayed by clicking its Tab. 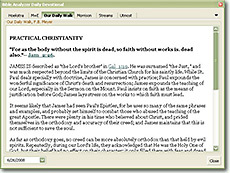 When a reference is clicked in the Bible Panel, comments will be listed in the Commentary Panel (bottom left). 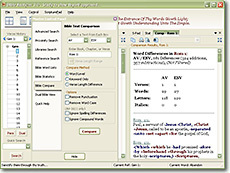 If a word is clicked, its definition will displayed in the Dictionary Panel (bottom right).The mouse cursor over a reference will cause the verse to be displayed in a pop-up. 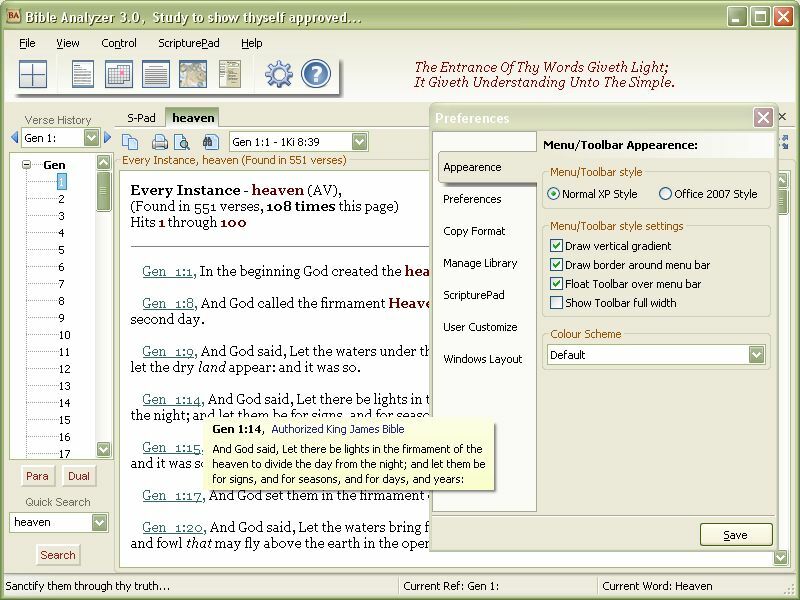 If the reference is clicked, the verse will display in chapter context in the Bible Panel. 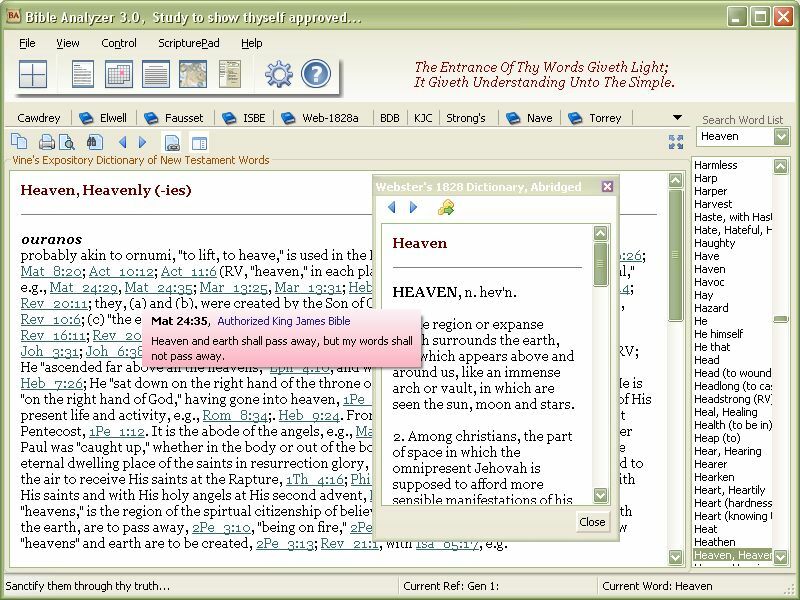 When the Para Button (under the Bible Tree) is clicked the selected chapter will be displayed in a aligned table including all loaded Bible Texts. This makes translation comparison very quick and convienent. 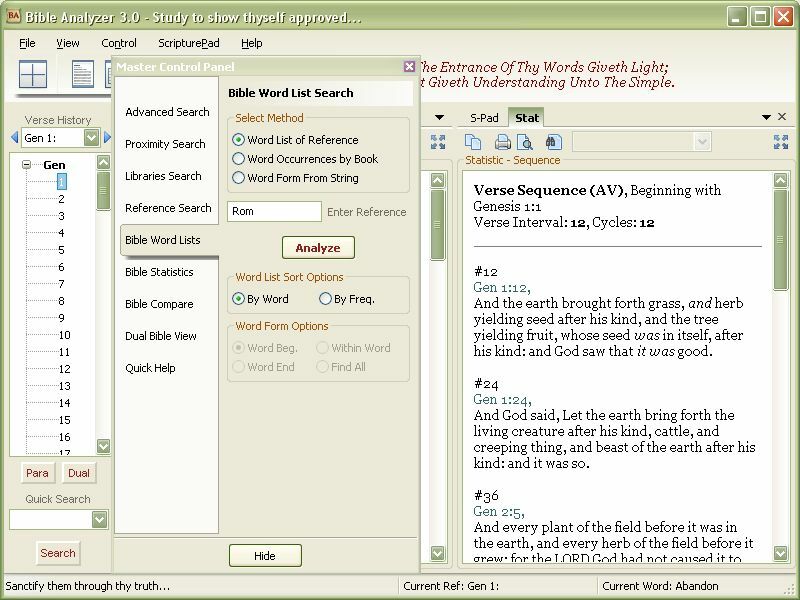 Also there is a Right-Click Menu which allows the user to search the current Bible text for the selected word, search the Library Resources for the word, copy text, jump to a Library Resource Topic, etc. If a reference is right-clicked, a different set of menu items are available, such as Export verse to ScripturePad, View Statistics, etc. 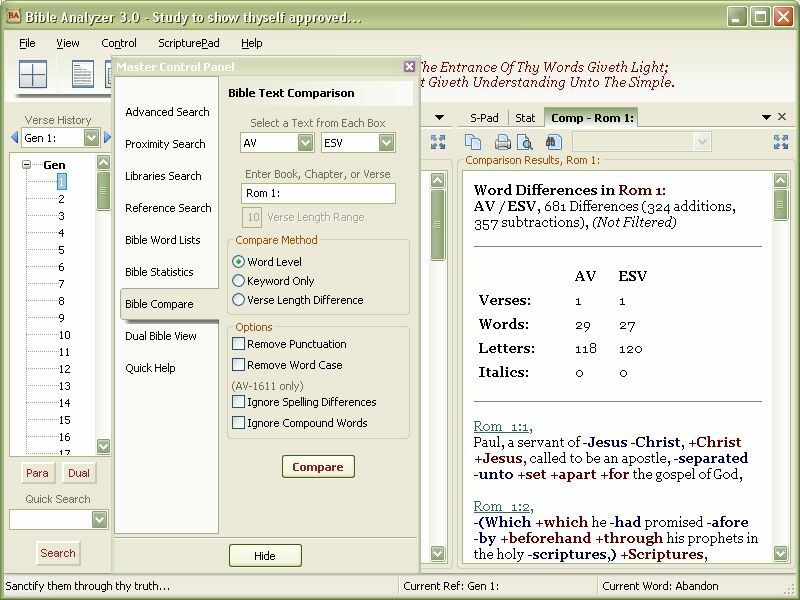 If you have the Authorized Version 1769 w/Strong's and the Strong's Dictionary of Hebrew and Greek Words modules loaded (available with the Bible Analyzer Suite CD-Rom), Strong's numbers will be displayed beside the corresponding word(s). Placing the mouse cursor over a number will cause Strong's definition to display in a popup. If a Strong's Number is left-clicked, the definition will be selected in Strong's Dictionary (and other resources that use Strong's Numbers) in the Dictionary Panel. 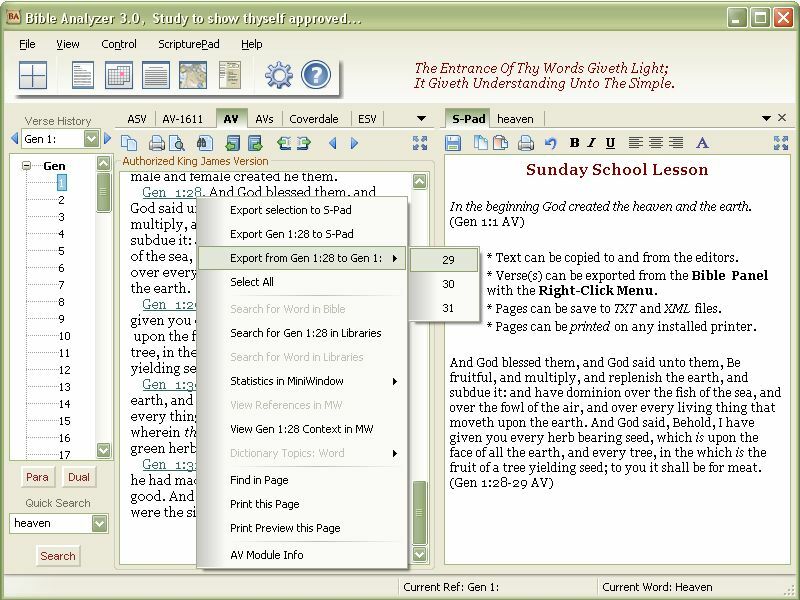 The definition can also be displayed in the MiniWindow as shown here with the Bible Panel in full screen display. If the option is selected from the Dictionary Toolbar Button, when a Dictionary Tab is selected, the corresponding Entry List will be displayed to the right of the Dictionary Display. Selecting or typing any entry will display the result in the Window. If any other Resources have the Entry, a Blue Book Icon will be displayed in the corresponding Tab. The Commentary Panel behaves much the same. 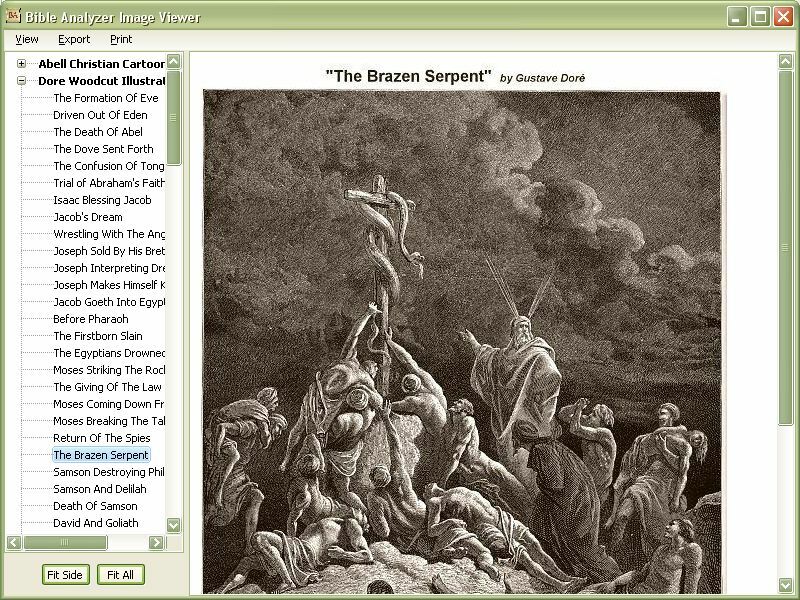 All Bible references in the various Displays will on mouse-over show the verse in a Pop-up Window. 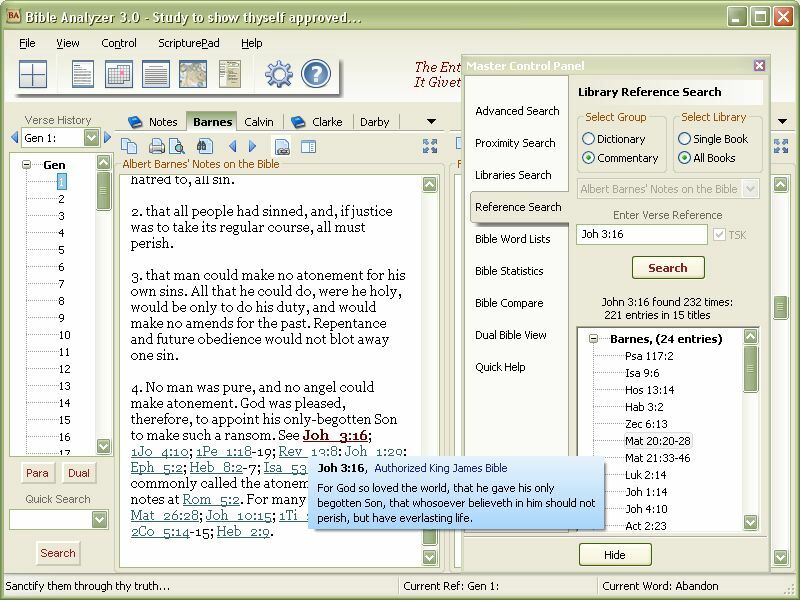 If the reference is clicked, the verse will display in chapter context in the Bible Panel. Here the Pop-Up Window is a light red gradient. The color can be changed in the Preferences Dialog. The fourth panel contains ScripturePad word processor and the results of various Master Control Panel functions. The first tab is always ScripturePad, any results from an Advanced Search, Proximity Search, Statistic functions, Text Comparison, Parallel View, Dual View, ect., will display under seperate tabs in the same panel. For easy access each tab from a function will remain until deleted by the user or until Bible Analyzer is closed. Also shown is the Preferences Dialog. 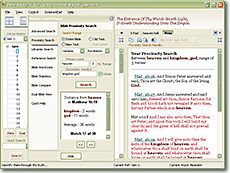 ScripturePad, a new feature in Bible Analyzer 3.0, is an integrated word processor capable of text formating and printing. It supports Bold, Italic, Underline, Font Size and Color, Paragraph Formating, Printing with Preview, and other word processing capabilities. 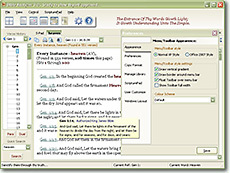 In addition, verse(s) can be directly exported from the Bible Panel into ScripturePad for convienient sermon or lesson preperation. The Notes Editor in the Commentary Panel has most of the same features except it saves the users notes/comments linked to the current reference. The Master Control Panel can be opened by clicking the Button on the Toolbar or by pressing F2. 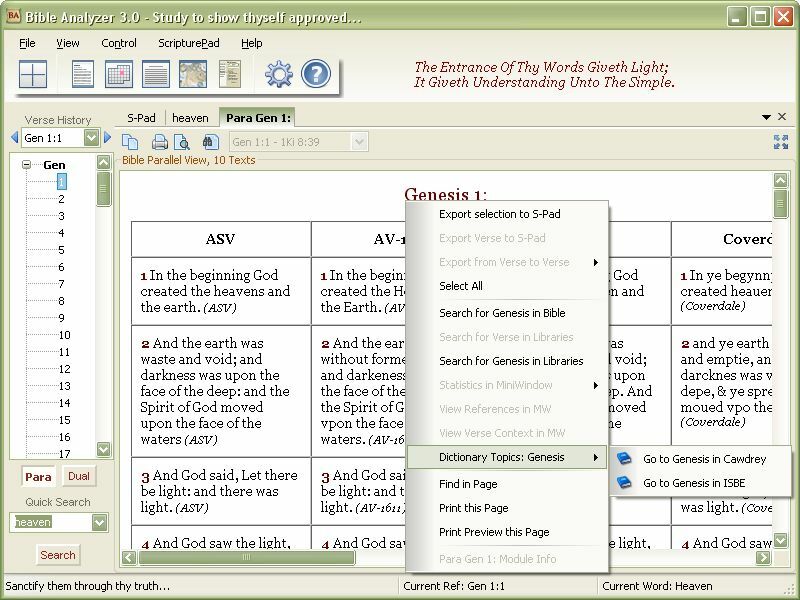 It is a convienient and compact control in a seperate window for accessing Bible Analyzer's advanced functions. 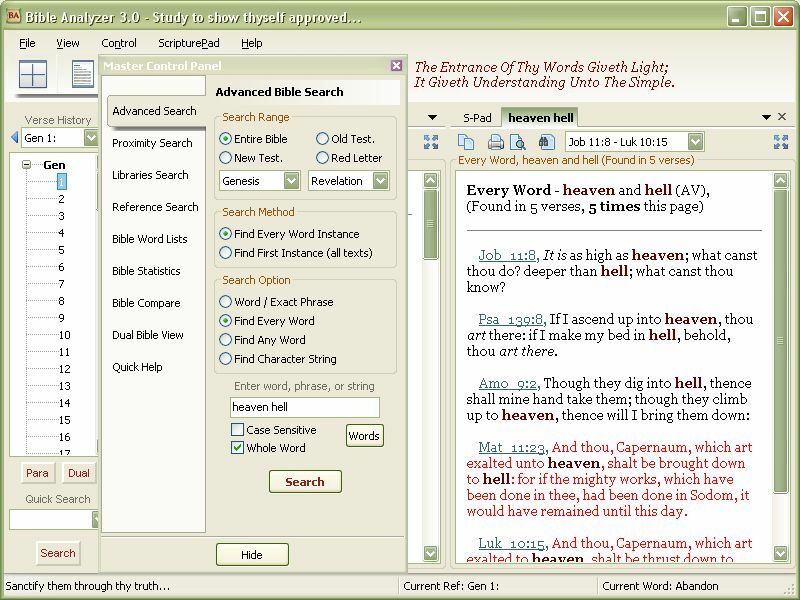 This is the Advanced Bible Search Function which will perform various Bible searches. Searches can be limited to the Old Testament, New Testament, Red-Letters, a single book, or any span of books. 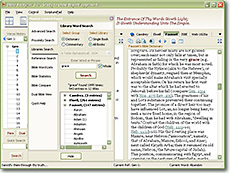 Several options are available such as search by Word or Phrase, Every Word, Any Word, or by Character String. Wildcard characters can also be used. The results will be displayed in the Results Panel. The powerful Bible Proximity Search is the next Tab down on the Master Control Panel. With it the user can search for multiple words in relation to a primary word within a specified verse range. For example, all instances where mercy, peace and truth are within 3 verses of grace. The Hit Statistics will display in a window within the Control and the first set of results will display in the Results Panel. To view the next set of results, click the Next Button (>>) in the Control. The Previous Button (<<) will show the previous results. The third Tab opens the Library Search Panel. 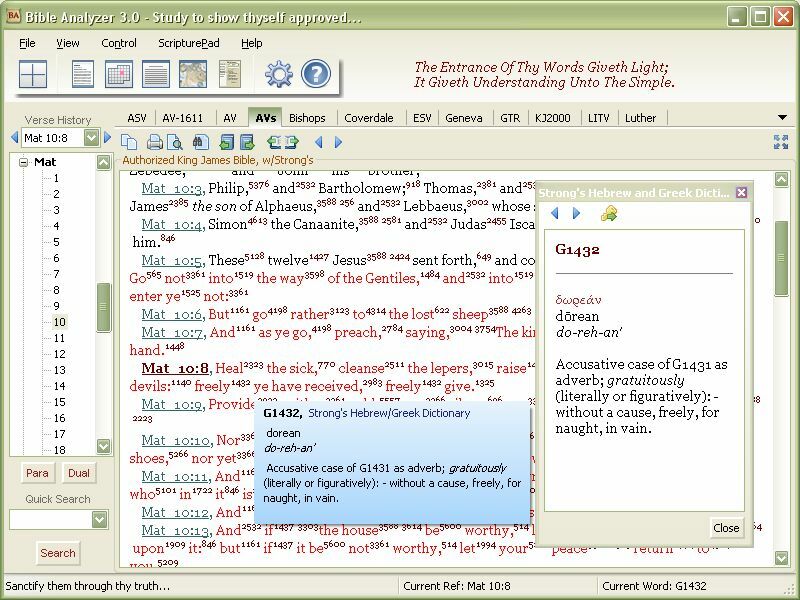 This feature will search all the Commentary or Dictionary Resources for the entered word or phrase. 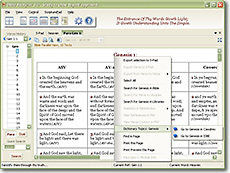 The Hit Results will display in a window within the Control in a form similiar to the Bible Tree. The Hit Statistics will display immediately above the Hit Results. A single resource can be searched or all searched. To view a Hit, select the desired reference in the Hit Results display and click on a reference Entry Title. The results will be displayed in the appropriate Display with the Seach Word (or phrase) identified with a dark red, bold font. The fourth Tab opens the Library Reference Search Panel. This function behaviors much the same as the Library Search Panel except it searches for Bible references within the Library Resources instead of words. 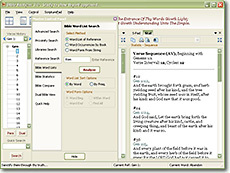 Tab five opens the Bible Wordlists Feature. 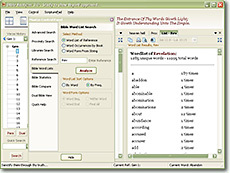 This panel is used to find wordlists of a book or chapter with a Frequency Count, Word Count by Book, Word Form Varations with various options. 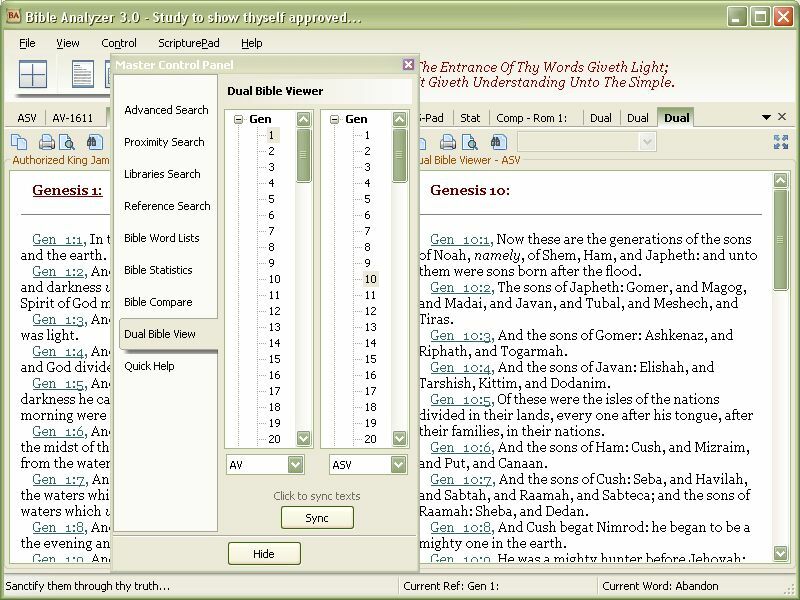 Tab six in the Master Control Panel opens the Bible Statistics Feature. 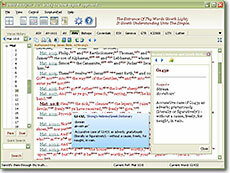 This function will produce various text statistics for the selected Bible Text. For instance, it will find Verse, letter and Word Sequences; List verses by Numerical Sum, Statistics of a Reference, Count Verses, Words, Letters, Questions, Italics, etc. ; in all texts, and other statistical results. The results will be displayed in the Results Display. 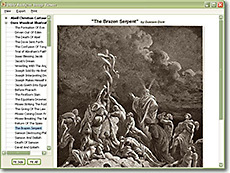 The unique and powerful Bible Compare Feature (the seventh Tab) will compare any two Bible Texts in a number of ways. 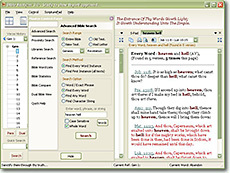 It will display every difference between two texts with a + marking added words and a - indicating subtracted words. It will also display all the verses where an entered Keyword is omitted in the Secondary Text (this is a very revealing feature that shows the ommission of important words in the modern versions), and it will display all verses with an entered word count difference between verses. The eighth Tab contains the Dual Bible View Panel. 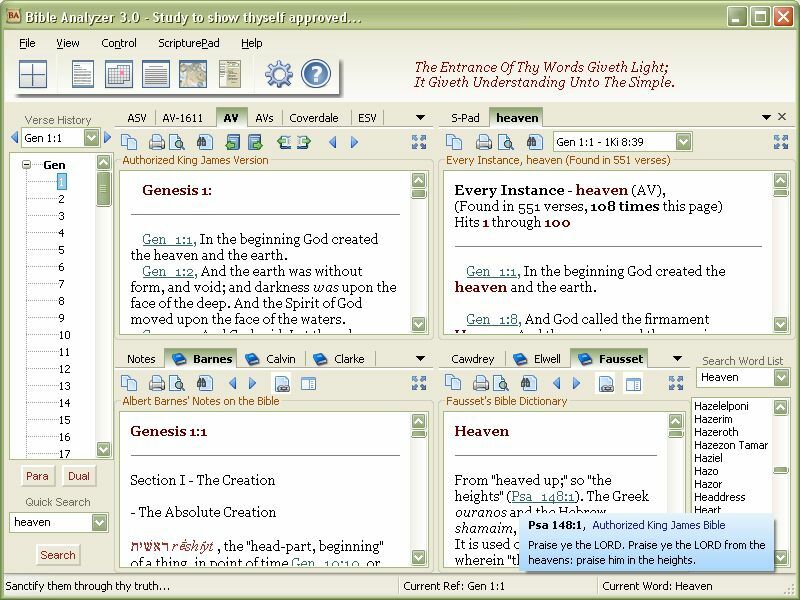 This function will display two Bible Trees, one for each Panel in the Main Display. 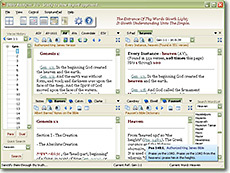 The Main Display will expand into two equal size Bible Displays, one for each text. The left Bible Tree will display what is displayed in the main Bible Tree. The Sync Button will syncronize the texts. Two different texts can be displayed or different chapters of the same text. 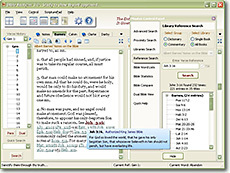 The ninth and last Tab in the Master Control Panel contains a Quick Help Display with access to Bible Analyzer information. 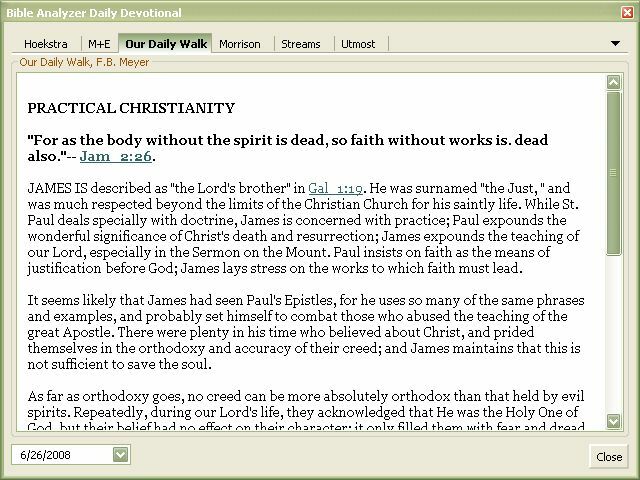 The new Daily Devotions Reader can display multiple devotion modules in its tabbed interface. The date will update each day and can be easily changed to any date. 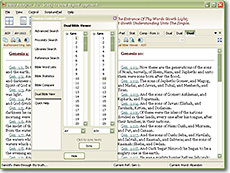 At present six modules are available in the Bible Analyzer Suite CD-Rom. 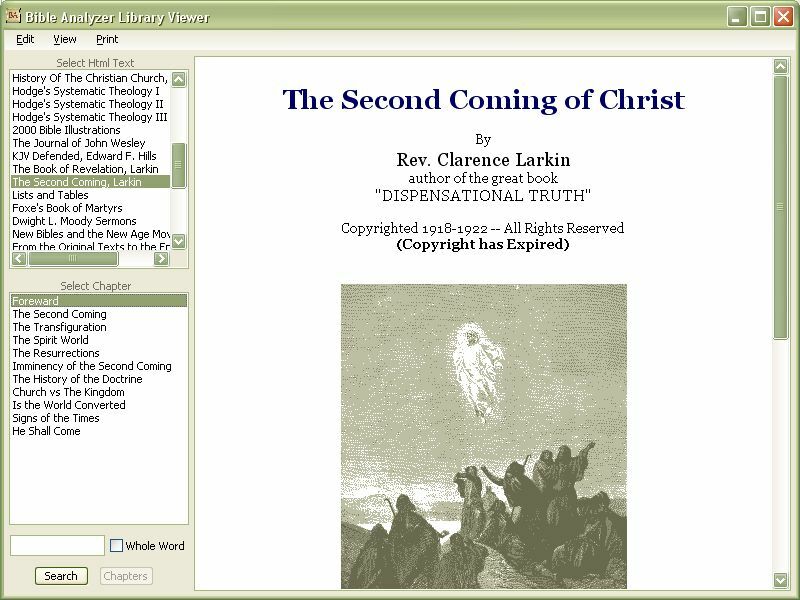 This is the Image Viewer which is a seperate window; it can only be opened within Bible Analyzer. The Image Viewer will display all properly formatted image archives in the Modules/Image folder. 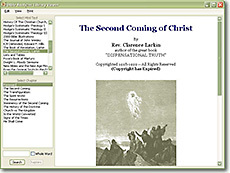 The Bible Analyzer Suite CD-Rom contains over 500 images. The download version because of size limitations only has a sample of available images. The Image Viewer can resize the displayed image to fit the window or resize to fit the shortest side for easier scrolling of larger images. Scrolling can also be done with a mouse down click over the image. Images can now be printed or exported. 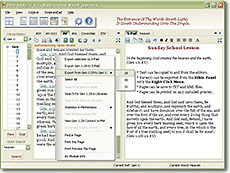 The Book Viewer will display html custom formatted texts. Simply select the Title and the Chapter (if applicable) and the text will be displayed. User made texts can easily be intergrated into the list by following the instructions found in the User Manual. 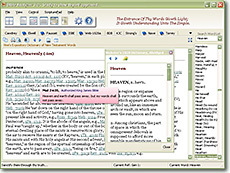 Pop-up verses will display as usual over any references in the text. Texts can be searched and printed. Order the Bible Analyzer Suite CD-Rom Today!